The Heartland Oak Vented Log Set by Duluth Forge recreates the look and feel of a real wood-burning hearth. 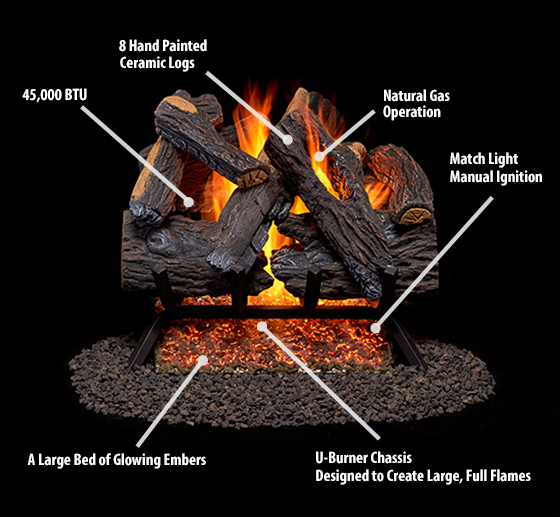 This Vented Gas Log Set was molded from real wood providing a realistic appearance that incorporates charring, deep bark texture and split accents. The U- Burner chassis design provides multiple rows of flames which brings you the most realistic flame patterns. Like a real wood burning fireplace, the Heartland Oak requires a fully functional chimney with an open flue when in use. The glowing embers create the most illuminating beauty of a warm and classical ambiance.